Recently a writer friend, Nancy Connally, shared two books with me that she thought I would enjoy. Thank you Nancy, you were right! I did enjoy. The books are, OKLAHOMA REUNION and THE RANCHER'S REUNION by Tina Radcliffe. 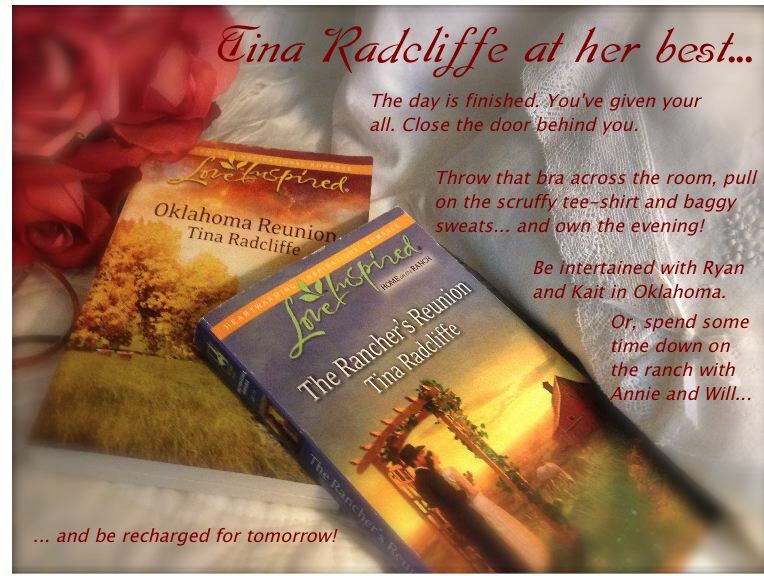 Being a native Okie, I especially enjoyed reading OKLAHOMA REUNION. It takes place in Okie land. The characters move about in places I'm familiar with, the Tulsa State Fair for example. Oklahomans and Texans like their state fairs. I'm smiling thinking about the fun times. Do you enjoy reading romance with a good story plot? Characters you can root for? An ending to make you sigh? And when you've finished the book, you want to pass it on to someone else to enjoy? Well, feel free to pass these two books on to daughters and friends. A fun, satisfying read from start to finish. If this is your kind of reading, then Tina is an author you'll want to add to your list of good reads. You can always find Tina over at http://www.seekerville.blogspot.com/, a very active member she is too! Tina has a new book coming out late August. The title is intriguing, ROSETTI CURSE. I'm wondering, is it a mystery romance, hmmm? And... Woman's World is publishing her short romance in the August 22 issue. Watch for it! Boy do you have an artistic eye. Gorgeous picture!!!! Thank you for the kind and generous comments!! Thank you, Tina! I'm looking forward to reading ROSETTI CURSE!! Tina also did something I’ve never seen in a romance. She had the characters go into a book store, Steve’s Sundry, to buy a book and then she held a book signing in that same store, Steve Sundry, where you could buy the very book in which the characters where in the same store also to buy a book. I’ve lived in Tulsa since 1971 and Tina did a great job creating the ‘look and feel’ of T Town. She will always be welcome here. I enjoyed your posting on Seekerville this morning. Thanks, Marsha, for the kind words.